You can describe the Jacuzzi J-200 Collection in a single word: Classic. It features jets in all the right places and a dual-stage water treatment system. It also comes standard with multi-colored lighting to create the perfect mood for every occasion and convenient cup holders so you can stay hydrated and happy during your super-long soaks. The J-200 Collection is so popular that we offer eight different models, each with a variety of options when it comes to interior color, cabinet, and more. 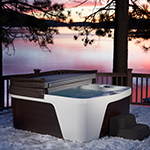 The J-300 is the Signature collection of the Jacuzzi lineup. 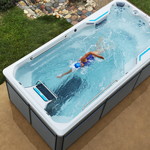 Focusing on comfort, these spas come standard with PowerPro Jets®, our premium jet system. 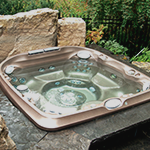 These hot tubs also feature headrests, ergonomic seating, and a revolutionary control panel for ease of operation. 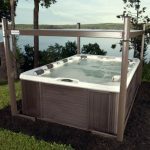 With easy maintenance via the CLEARRAY On-Demand system, the J-300 Collection offers the largest open seating configuration available in the Jacuzzi line. Seating up to 7 adults, the Comfort Collection features 20 FX Jets, a jetted foot dome, LED-lighted footwells, pillows, cup holders, and a soothing waterfall to soothe and relax you. To round out your hot tub experience, select from the generous line of Jacuzzi Exclusives™ accessories available! For some, the goal of a hot tub is merely to relax, perhaps invite a few friends over, or enjoy some super special date nights for two. Others desire a deeper massage experience. Those are the people in mind when Jacuzzi designed the J-400 Collection. But don't think its utilitarian nature means skimping on style. Nope, the J-400 Collection is elegant and stylish, featuring premium lighting effects and a backlit water fall as standard features. If extraordinary is your ordinary, check out the J-400 Collection by Jacuzzi. The Jacuzzi name is legendary. 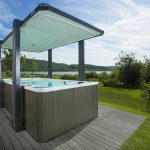 Find out why when you test soak in one of the luxury hot tubs that make up the J-500 Collection. These models come standard with industry-shaking curvy designs, outer lighting never before offered on hot tubs, and inspired exterior designs inspired by woven textiles. These hot tubs are not just good for your body -- they look astounding wherever you place them. Does the Minimalist Movement have a hot tub? You bet they do. The J-LX Collection is designed with that minimalist appeal, featuring the flat-top rail that's more than just a pretty face. This Collection exceeds all existing standards of energy efficiency, without sacrificing a thing in terms of power. Equipped with the CLEARRAY® System, water care is minimalist, too!